This alters a few game setting to make player-made potions competitive with store-bought or found ones. SureAI can use anything I make in Enderal. One of the common complaints with Enderal is that the crafting skills are not worth investing in. This is because in 'vanilla' Enderal, even at 100 in a given skill, one cannot compete with store-bought or found items due to a lack of the perks Skyrim has to increase crafted items' potency. In Alchemy, for example, Skyrim had perks to increase crafted potions by up to 100%, and relevant perks beyond that could multiply the potency by 1.25 up to twice. In Enderal, we only have a 20% increase to all potions, and up to a 25% increase for potions that restore health/magicka/stamina or 40% for poisons. The increase yielded from increasing one's skill to 100 only increased power by about 41% above what one got with an Alchemy skill of 15. This means that with an Alchemy skill of 100 and all relevant perks, a restore health potion (for example) would only restore 16 or 17 HP/second for 4 seconds. That's slightly better than a Cheap Health Potion. 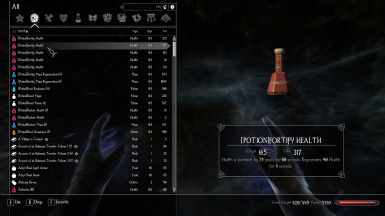 My goal in this mod was to make it such that with 100 in Alchemy (and without the use of perks), one's potions would be equivalent to the Exclusive versions of a potion. I have achieved this goal. As you can see, one begins slightly "ahead of the curve", but winds up exactly on target at 100 Alchemy Skill. Relevant perks can increase these numbers further. I feel this is appropriate, as there is an Enderal loading screen which states that player-crafted items are stronger than those that can be bought in stores or found in dungeons. My mod makes that actually the case. Simply extract the .esp into your Skyrim Data folder. It is a very simple mod, nothing else need be done. Uninstallation is simply deleting the mod. There should be no save-file nor compatibility issues.